This Saturday volunteers from Austin College’s Alpha Phi Omega chapter, Phi Xi, worked with Boy Scouts of America Troop 604 in the campus’s second year of “Merit Badge University.” Merit Badge University, or MBU, is an event designed to provide the environment and opportunity for Scouts to continue their advancement towards Eagle Scout. This program allows them to earn merit badges that can be hard for troops with low resources to provide or are often relegated to specific seasons (like swimming). During MBU, scouts can earn up to two merit badges in one day. This year’s MBU is the first to have mixed attendance after the historic 2017 decision to accept female membership into the once non-coed youth programs of the Boy Scouts. According to the Executive Director of the Texoma Valley, Michael Henrichsen, two girl troops representing Whitesboro and the Dallas area, made up 11 of the 142, or roughly 8%, of the total attendance. From left to right, Sophomore Gabrielle Nguyen (APO Assistant Education Coordinator) and Senior Yassi Payma (former APO President) demonstrate Chess to a group of attentive scouts. 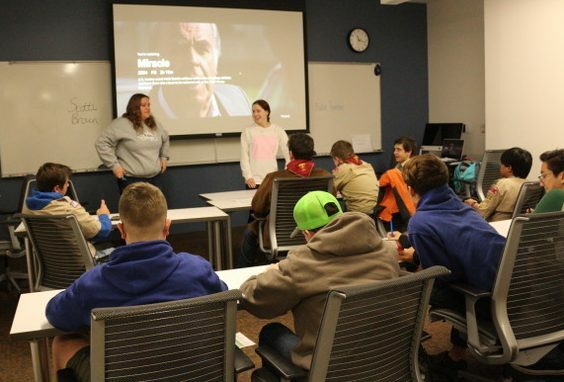 Senior Jacob Houck, who is an Eagle Scout and APO member, and Sophomore Jessica Thoennes, currently serving APO education coordinator, teach the “Personal Management” Merit Badge. Junior Megan Slaughter (VP of Service) and Sophomore Melika Monfared (Roo-Bash Chair) explain Astronomy to a few of young scouts. I was also introduced to Dr. Henry “Hank” Gorman, APO’s sponsor at Austin College and Chair of the Texoma Valley’s “Scouting for Food” program. He looked proud to see his sponsored organization at work. When asked why he thought MBU was important he had plenty to say. The main benefit is getting young people on to a college campus, Austin College in particular. His second was that it offered both the college and APO an excellent opportunity to connect with the community through service-oriented leadership. Dr. Gorman also took the time to enlighten me on the history of the Boy Scouts co-ed programming, like Varsity Scouting and Sea Scouts, which have been co-ed for decades. The new programming is focused on opening up the lower levels of the organization to girls. He also expressed regret that these policies are only arriving now when he told me that his daughter had wanted to be a Boy Scout when she was a child. 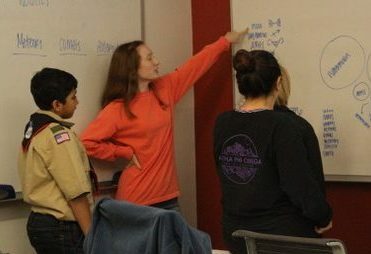 From right to left, Junior Addie Pederson (APO President) and Senior Scotti Brown (APO Family Cup Chair) instructing for the “Citizens of the World” merit badge. As I left my last interview I found myself awed by the diversity of the scouts that were coming and going from their lunch in the cafeteria. There were scouts representing almost every facet of society and every type of child and teenager, yet I did not personally see any of the girl scouts in the mix. I was told that both troops were busy working in the all-day swimming merit class and that I would not be able to interview them for their thoughts on MBU and the effects of the new policy. I was also not able to interview any of the scouts themselves because they were extremely busy heading off to their respective classes. Ultimately, it is these children’s futures that matter the most and it seems that they are in good hands, but only time will tell if the appeal and opportunity of Merit Badge University will continue to attract its new audience.